The Dremel 4000 multi tool is one of the most universal tools on the market! It is an excellent, high quality and robust tool, ideal for both hobbyists and dedicated jewellery makers. Despite its small size this tool is surprisingly powerful and offers numerous possibilities due to the multitude of accessories enabling detailed sanding, carving, engraving, cutting, grinding, cleaning and polishing. 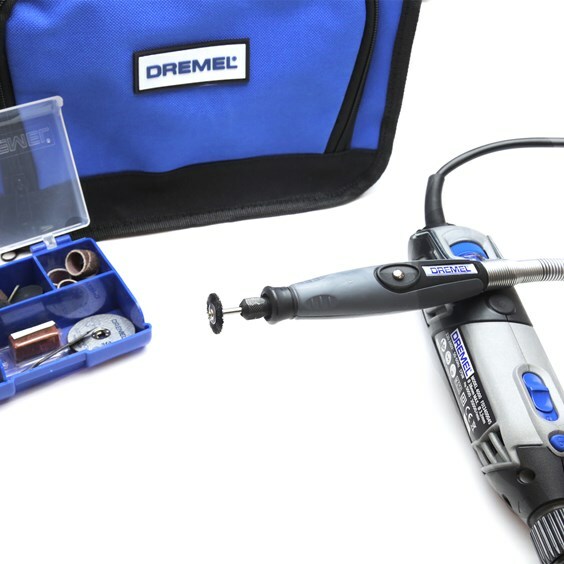 The Dremel 4000 multi tool kit that we supply comes with a flexible shaft that enables precise, detailed work particularly in hard to reach places and provides more comfort, flexibility and fingertip control. In total the kit includes the Dremel 4000 multitool, the high quality Dremel Flexible Shaft and 45 genuine Dremel accessories including EZ SpeedClic and EZ Twist Nose Cap. All this is packed in a convenient case. 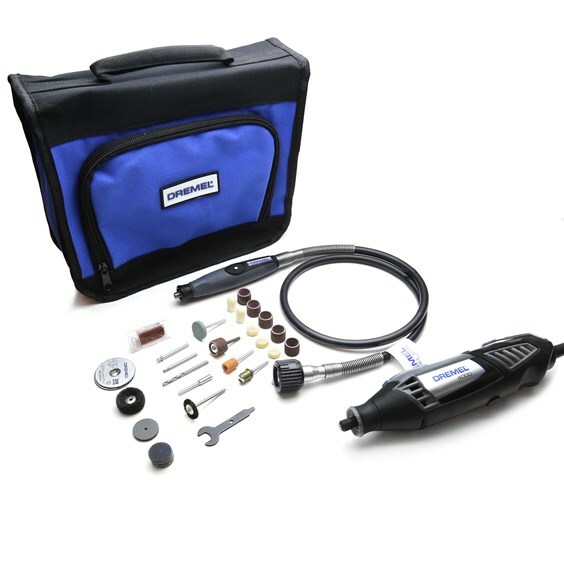 This is a high value kit, offering great value for money for the more demanding user allowing you to complete tasks such as sanding, carving, engraving, routing, cleaning and polishing. On this page we go into detail about the tool and it's specifications as well what you can do with the tools that come with it! 2x Mandrels - use to mount different accessories like felt polishing wheels or cut-off wheels. 1x Mandrel for the EZ SpeedClic accessories. Easy pull, twist release - simplifies the process of changing cutting wheels. 1x Twist Drill Bit, 3mm - perfect for drilling holes in metals. 1x High Speed Cutter, 3mm for use on wood, plastic and soft metals. 1x Sanding Band & Mandrel, 13mm, grit 60 - great for the first stages of sanding and polishing. 2x Sanding Band, 13mm grit 60 - great for the first stages of sanding and polishing due to coarse grit. 3x Sanding Band, 13mm grit 120 - great for the later stages of sanding and polishing due to finer grit. 2x Fiberglass Reinforced Cutting Wheels - for cutting in all sorts of metals (use with the EZ SpeedClick). 11x Sanding Discs 180 grit for sanding in contoured and hard-to-reach area - coarse. 9x Sanding Discs 240 grit for sanding in contoured and hard-to-reach areas - fine. 1x Grinding Wheel for general purpose grinding. 1x Silicon Carbide Grinding Stone for etching and grinding stone, glass, ceramics, porcelain and non-ferrous metals. 1x Aluminum Oxide Grinding Stone 9.5 mm for grinding metals, castings, welded joints, rivets and rust. Ideal for sharpening, deburring and general purpose grinding of most materials. 1x Polishing Compound - use with felt or cloth accessories to polish metals and plastics. Compound will remove a dull oxidised film and/or light surface imperfections. 3x Polishing Felt Wheels, 13mm - for bringing metal surfaces to a smooth finish. 2x Polishing Felt Points - for bringing metal surfaces to a smooth finish. 1x Nylon Bristle Brush for light deburring, cleaning and polishing of silverware, jewellery and other precious metals. 1x EZ Lock Finishing Abrasive Buffs, 180 grit - great for cleaning and light sanding on metal, glass, wood, aluminum and plastics. 1x Wrench - helps to tighten and loosen accessories in place. 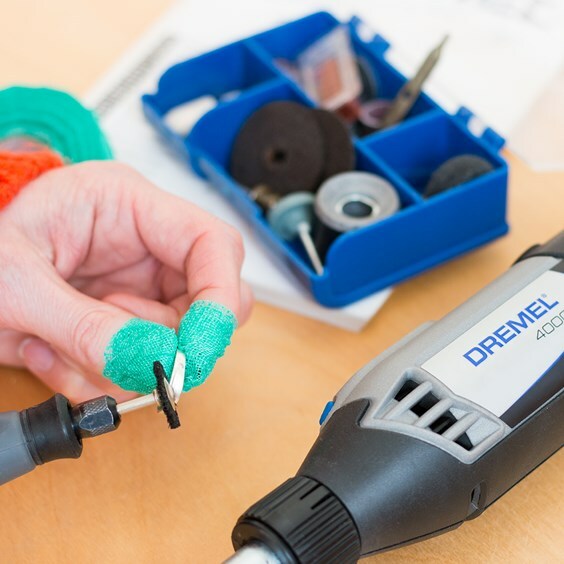 Whilst many of the accessories included with the Dremel kit are very useful - they are more aimed at the DIY market. We sell the following range of accessories for sanding, carving, engraving, cleaning and polishing metal which will lend themselves well to more specific aspects of jewellery making. Polishing Mops, Wheels & Points - are great for quickly polishing jewellery if you don't have a bench polisher. They are also perfect for getting into those awkward to polish shapes. Choose from bristle wheel, felt wheel, felt point, and soft polishing mop. Use with tripoli and rouge. Silicone Polishers - these are impregnated with fast cutting silicone carbide abrasives for excellent polishing results. We stock these in wheel, knife edge and in cylinder shape which are available in four different grades for different levels of polishing. Use these with our mandrels for silicone polishers. Burrs - burrs are used for adjusting stone setting depths, bezels, cutting grooves in metal and much more. Our best selling burrs are the stone setting burr and cup burr.